Not all is wonderful in Wonderland when Avice finds a way to crash the party. The Queen of Hearts wants nothing more than for life to be as it was. Avice, however, begins to steal magic from the Wonders and proceeds to dismantle the very fabric of Wonderland. Soon, the queen has no choice but to bring Avice back to her homeland, a strange place called Saxonia. There, perhaps she can find allies against her foe, a new home for her Wonders, and perhaps even a man to love. 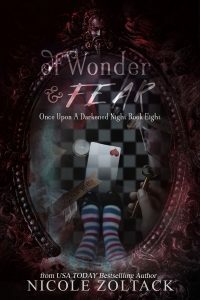 Of Wonder and Fear also includes the short story The Cost of Time.